The biggest increase in add-on services used by the airline’s four million passengers last year was not checked baggage. 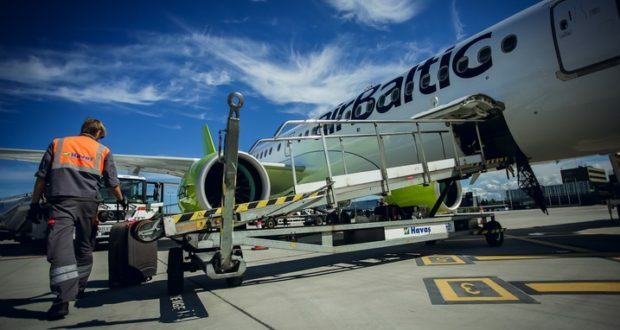 The Latvian airline airBaltic says it saw “significant ancillary revenue growth” in 2018, with several types of additional revenue earners being especially “popular” among passengers. Paying more to add a checked-in bag or suitcase to the reservation was the most widely used ancillary product among the airline’s passengers last year. Overall, while the airline carried more than four million passengers during the year on its 70 destinations from the Baltic capitals, it also carried over two million pieces of checked baggage. However, the biggest growth among the carrier’s ancillary products was recorded in the advanced seating reservations, which in 2018 generated a 26% revenue increase compared to the previous year. Most often among these reservations, passengers choose to reserve a window seat, airBaltic says, adding that “thanks to the improved overall comfort and larger windows, passengers use the service most often on flights performed by the new Airbus A220-300 aircraft”. The top destinations from the Latvian capital Riga where passengers are reserving seats are London, Tallinn and Berlin. Passengers on all routes can preselect a seat online up to an hour before departure. “Buying the most affordable basic-class tickets and adding a baggage to the reservation is very popular among our passengers,” says Eva Plakane, senior vice president for revenue management at airBaltic. In related news, airBaltic has been named Airline Market Leader in the 2019 round of the ATW Airline Industry Achievement Awards, which Air Transport World will be presenting at the 45th annual event in New York on March 26.